I have an interest in old books, big box computer games and other paper ephemera. 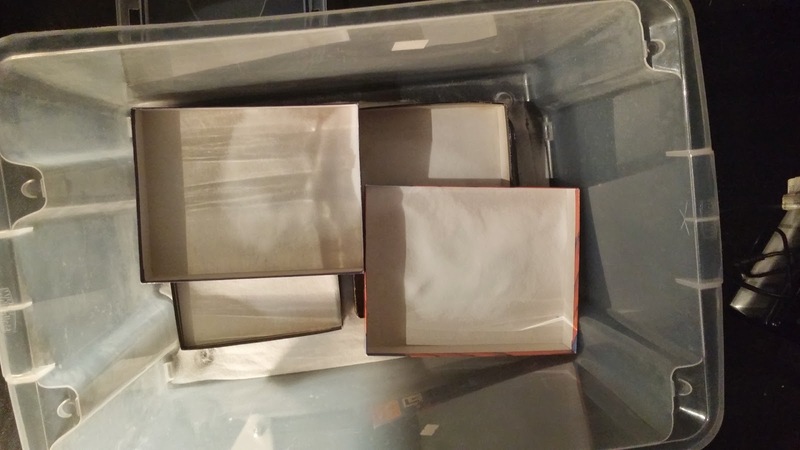 In the process of combing through and restoring a few items to a more usable state, I've experimented with a number of techniques for getting rid of damp residue, mildew and unpleasant odours from paper products. These tend to result from long-term storage in sub-optimal conditions, which you'll encounter both in things you've stored yourself (if you're unlucky) and in items bought at car boot sales, flea markets, bric a bracs and so on. Please note that I am NOT a trained restoration expert, and that we're totally not responsible for any damage that may result from attempts to reproduce these techniques. They're just what seem to be working for me so far. For similar reasons, I welcome feedback, comments, and suggestions based on your own experience. I use bicarbonate of soda for loads of things, from treating nettle stings to scrubbing down walls. It's a great natural deodoriser, de-acidifier, and de-humidifier, which makes it ideal for this task. The only reason I didn't use it in the first place was because I'd run out, and even the smallest of these jobs will require a lot of the stuff. I started with a kilo, which I divided between two smallish plastic boxes that I'm using for this proof of concept. The one below contains two glossy-paper game manuals that smell of mildew but have no visible spores. They are otherwise clean and in good condition. The next box, shown below, contained two books, one of them fairly rare but in terrible condition, that I rescued from a mouldering box of a friend's possessions during a storage clear-out. They're on standard paper, which is easier to deodorise and dry out than anything with a glossy finish, but which is also more prone to absorbing smells and moisture. In addition to being kept in an outdoor storage locker for years, they were previously exposed to cigarette smoke, various flats full of less than entirely house-trained cats, and sundry other environmental hazards, as well as simply being very well used in the course of things. 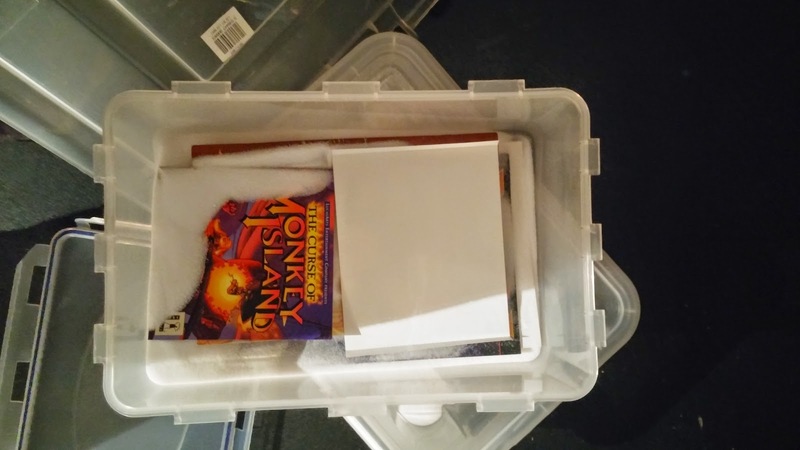 The technique for both glossy and standard paper books, leaflets, and game manuals was the same: bury them in bicarbonate of soda inside an air-tight box , seal the boxes, and gently agitate them to get the soda between their pages. 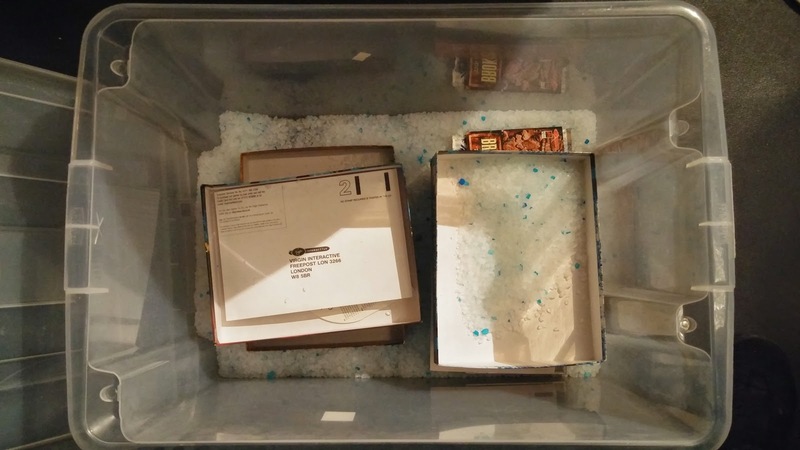 Larger items, such as computer game boxes, are carefully stacked into a larger box with a layer of bicarbonate of soda on the bottom. A layer of bicarbonate of soda is poured into the open half-boxes. Results of this technique have been excellent. After a little over a week, some very musty glossy manuals and game boxes smelled like new paper. The books no longer smell damp or of cigarettes, but they're still a little musty and I'm pretty certain they've have essential oil dropped on them at some point, unless someone's worked out how to make paper out of geraniums. Crystal cat litter is made of silica (the same stuff that goes into those moisture-absorbing bags marked "do not eat" that come with every item of electronics you've ever bought). A technique frequently recommended for de-ickifying (technical term) paper is to take two plastic boxes, one larger than the other, place litter in the large box and the item in need of deodorising in the other, inside the bigger box, without a lid. You then place an airtight lid on the larger box. I can safely confirm at this point that this does not work in the slightest. Experiment two involved burying a few items in the same cat litter. This was slightly more successful, but not remarkably so. Over a period of around three weeks, I've seen some decrease in mustiness of a cardboard "big box" game box, but little improvement to some glossy manuals. I also wouldn't be happy using cat litter for anything with particularly fragile paper, as the crystal chunks are a little on the hard and pointy side. The small amount of resulting dust was easy to clean off, at least - I'd definitely not try this (or even the box-within-a-box technique) with other kinds of litter, and I don't think that the technique provides any advantages over the bicarbonate of soda method detailed above. In future instalments, we'll look at cleaning box exteriors, plastic items, and floppy disks.